Child care (or "childcare", "child minding", "daycare",or "preschool") is the caring for and supervision of a child or children, usually from newborn to age thirteen. 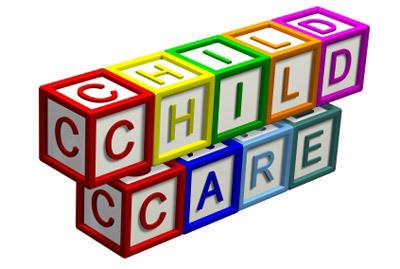 Child care is the action or skill of looking after children by a day-care centre, babysitter, or other providers. Child care is a broad topic covering a wide spectrum of contexts, activities, social and cultural conventions, and institutions. The majority of child care institutions that are available require that child care providers have extensive training in first aid and are CPR certified. In addition, background checks, drug testing, and reference verification are normally a requirement. Child care can cost up to $15,000 for one year in the United States. Approximately six out of every ten children, or almost 12 million children, age five and younger, are being jointly cared for by parents and early childhood educators, relatives, or other child-care providers. In home care is known as family child care it typically is provided by nannies, au pairs, or friends and family. The child is watched inside their own home or the caregiver's home, reducing exposure to outside children and illnesses. Depending on the number of children in the home, the children utilizing in-home care enjoy the greatest amount of interaction with their caregiver, forming a close bond. There are no required licensing or background checks for in-home care, making parental vigilance essential in choosing an appropriate caregiver. Nanny and au pair services provide certified caregivers and the cost of in-home care is the highest of childcare options per child, though a household with many children may find this the most convenient and affordable option. Many nannies study towards childcare qualifications. This means they are trained to create a safe and stimulating environment for your child to enjoy and thrive in. Typically, au pairs or nannies provide more than routine child care, often assisting with daily household activities, including running errands, shopping, doing laundry, fixing meals, and cleaning house. At the same time, a nanny or au pair is not always the best methods of childcare. Nannycare is the most expensive form of childcare. Recruiting a nanny can be costly when using a Nanny agency. Weekly salaries for nannies are 2 to 3 times the cost of a week of daycare. It confines the child into a world of their own. It keeps them from interacting with other children a lot of the time. As mentioned the caregivers do not need licenses or background checks so there is no way of telling if a person is really qualified or has a criminal background (unless you live in a country where there is an option of obtaining home-based care through a government licensed and funded agency). These things should be taken in consideration when making a choice. Family child care is provided from a care giver's personal home, making the atmosphere most similar to a child's home. State licensing requirements vary, so the parent should conduct careful interviews and home inspections, as well as complete a background check on the caregiver's license. Any complaints against the caregiver will be documented and available for public record. Family care (depending upon the relative levels of state subsidy for centre-based care) is generally the most affordable childcare option, and offers often greater flexibility in hours available for care. In addition, family care generally has a small ratio of children in care, allowing for more interaction between child and provider than would be had at a commercial care centre. Family child care helps foster emotionally secure interpersonal relationships for everyone involved.The providers are able to communicate each day with parents on a personal level and share information about the development of the child. Providers care for multi-aged groups of children allowing children to remain with one caregiver for many years which helps children develop a sense of trust and security. Multi-aged settings allow children to learn from one another and allow siblings to stay together. Some family child care providers may offer parents more flexibility with hours of operation such as evening, weekend, overnight, and before and after school care. They may also offer care for children with special needs. Family day homes offer group care to young children in another person's home. This is often a choice families make based on either the desire to keep their child in a more typical family-friendly environment (compared to a child-care centre), or on finances, since a family day home may not be as costly as a centre-based program. The adult-to-child ratio may be the same, but the environment more closely resembles that of a family's home.